Several days ago I spoke at a conference in Washington on the subject of the reset in relations between Russia and the US organized by the conservative Heritage Foundation, which traditionally represents the interests of the Republican Party. The fact that the main presenter was Speaker of the House of Representatives and Republican John Boehner shows how seriously the Republican Party is going to look at this issue during the upcoming electoral cycle. And there is nothing shocking about this. Every other foreign policy issue, whether it’s Afghanistan, Iran, or Iraq, is linked in one way or another with the actions of the Bush administration, while the idea for the reset in relations with Russia and the bets that were hedged on Medvedev – or, more specifically, on a split within the tandem – was thought up and materialized by the Obama administration. Putin’s imminent return to the post of president makes obvious the failure of Obama’s attempt to support “liberal modernizers” in the Kremlin, which the Republicans will undoubtedly remind him of before the next election. What was more unexpected was the attention this conference got within the Kremlin. As quickly as the next morning, Foreign Minister Lavrov advised the House speaker to use more traditional lines of communication with the current government and interparliamentary contacts. There were more than a few Russian journalists in the auditorium, who usually don’t indulge their attention in events like this that lack official status. The first question to presenters is always posed by the head of the Washington bureau of ITAR-TASS, Andrei Shitov. He did not entertain any particular notions of variety. I, for instance, was asked a question from the traditional Kremlin propaganda arsenal: why are the views of the opposition not popular among the Russian people? When asked my counter question – when is the last time he saw me on federal television – he shrugged his shoulders and said he couldn’t remember. Interestingly, this dialogue was preserved in the official ITAR-TASS report, where my presentation was noted in totally correct fashion. 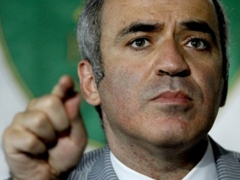 But two days later the news resource Infox released a piece of Kremlin agitprop about how bloodthirsty Kasparov is calling on the US to make war against Russia. The Kremlin’s reaction is completely understandable, because the main stress of my presentation was on the need to pass a law on sanctions against particular Russian civil servants. This piece of legislation, already looked at by the Senate, proposes introducing sanctions against figures involved in the persecution and killing of Sergei Magnitsky, and could be expanded to include the list of those involved in persecuting the company Yukos and another bunch of high-ranking civil servants who have violated both Russian federal law and our country’s international obligations. The Russian government reacted extremely severely to the threat to their financial interests – they warned the Americans of retaliatory measures that would include an end to transit to Afghanistan (the penetration of the Taliban into Central Asia, inevitable in the event of an American withdrawal from Afghanistan, is fraught with the rise of Islamic fundamentalism in this volatile region – a factor, of course, that is not remotely significant compared to the ability for Russian bureaucrats to purchase foreign property unhindered). As could be expected, the Obama administration, having made the reset in relations with Russia one of its primary foreign policy trump cards, is doing everything possible to keep this bill from passing. That’s why we have this secret list drawn up by the State Department that the Americans hastened to trumpet and which immediately received a rebuff from the Russian Foreign Ministry, which announced that a retaliatory Russian list will be worse than the American one. It’s obvious that no secret lists are going to have any effect. The Putin regime is afraid most of all of the publicity of this issue. But the bill has a chance of being passed, as it is already supported by many prominent Republicans and Democrats. Paradoxically, the top-priority issue of the reset – having Russia accepted into the WTO as soon as possible – prevents the White House from disrupting the consideration of the Magnitsky Act in the US Senate. Completing negotiations over the WTO issue makes it necessary to repeal the Jackson-Vanik amendment, without with the US cannot ratify Russia’s entrance into this organization, and despite the anachronistic character of the amendment, which was adopted back in 1974, many senators and congressmen continue to see it as the singular link between the observance of human rights and bilateral relations. In such a situation, it is totally probable that there will be an exchange of the Jackson-Vanik amendment, which prejudices the commercial interests of the entire country, for Bill S1039, which affects the concrete interests of unbridled civil servant thieves. Leaders who have been stripped of democratic legitimacy know that their power is based on the absolute loyalty of their apparatus and on maintaining an image of toughness and invincibility. Putin’s inability to protect the interests of bureaucrats and oligarchs on such key issues like visas and foreign bank accounts will inevitably lead to a collapse of the entire system. That is why the Kremlin feels that an attack on Putin’s clique is comparable to declaring war on Russia – an attempt to pass off the interests of Putin and his cronies as the interests of the entire country has become the de-facto cornerstone of all current Russian foreign policy. In all of my presentations abroad I have called on representatives of Western countries to learn to separate the interests of Putin’s oligarchy from those of the Russian people. At the conference in Washington I specially noted that banks, not tanks, need to be used in the battle against the Putin regime. A regime that grows on unlimited corruption and made control over financial flows the goal of its existence, vulnerable most of all precisely on the banking front.